Do Looks Matter in Health? 1. Do you have to look healthy to be healthy? Just because someone appears to be healthy or fit on the outside it doesn’t mean they’re healthy on the inside. This is well established. In fact, many people, particularly in the fitness realm, devastate their health in the pursuit of looking fit. An outward healthy appearance is usually reflective of inside health (i.e. most healthy people look healthy) but it’s not a guarantee. How about the opposite? Is it possible to be healthy on the inside but not look it on the outside? There’s been a trend recently to get society to accept being overweight as being healthy but I wonder if this is even possible. Can you be a little overweight and be healthy? Can you be a lot overweight and be healthy? If so, where do we draw the line? 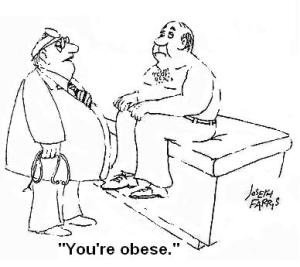 How overweight is ok? How about someone with bad skin? Or who’s lost their hair? Or is skinny but has just a little belly? Who’s eyes look a little gray and lifeless? Or is too skinny? Or simply looks unhappy? If you don’t look healthy, are you truly healthy? 2. Should you have to look healthy to give health advice? One of my favorite thinkers in health is Paul Chek. One of his tag lines is basically this: Ask your doctor to take off his shirt. If you don’t like what you see, walk out the door. He’s in good shape and makes no time for health advice from people that don’t look healthy and/or fit. Is that a bad perspective to have or is it a good philosophy? Think of all the people, myself included, who give out health advice nowadays. Thousands of people across the globe offer advice on diet, fitness, lifestyle and health in general. Should they have to look the part to be trusted? Or can/should we feel free to look past the messenger? Would my advice on fitness/health/diet/etc. carry the same weight if I wasn’t in good shape? Probably shouldn’t in all honesty. I’ve been at this a few years and if I wasn’t in good shape it would call my theories into question. If the person giving the advice has been at it for more than a couple years, they should look, live, act and be healthy. If not, you should be a little more critical of their advice. It’s probably true that some people giving great advice started in a bad place and although they’ve made great progress may not ever be the picture of health but as a general rule if someone preaches health stuff and doesn’t look good then their advice is suspect. A person telling you how be healthy that doesn’t look healthy just makes you wonder. Of course, the opposite could be asked: do we mistakenly take things to be true if they’re from someone who looks healthy? I wonder how often this happens without us even realizing it. All in all, I think health preachers should look the part but that doesn’t guarantee what they’re saying is true or shouldn’t be put through your common sense filter to make sure it makes sense for you. P.S. Health includes being happy so if a person spouting health advice is rude, defensive, bitter or anything short of pleasant I would question if they’re really healthy. P.P.S. Do an Internet search of the big health gurus and see if you think they look as healthy as you think they should. Previous Our Skin Works, Right?